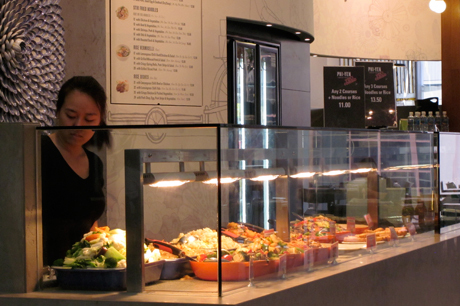 An established and well loved Vietnamese restauranteur family took on a lease in Perth's newest and most exciting cafe court at Enex100. Roxby Architects were engaged to design a kitchen and front counter servery within very strictly controlled limits. 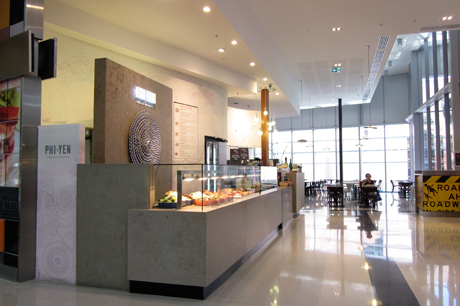 The requirement was for entirely natural finishes, state of the art food display and a touch of artistic individuality. 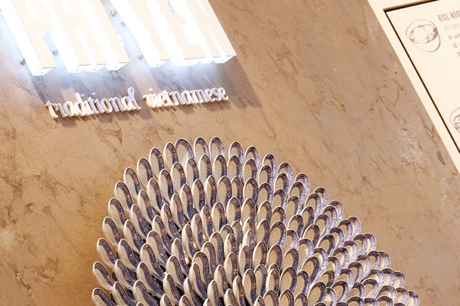 The result is a monolithic stone counter, a hand drawn wallpaper depicting the migration of Vietnamese cuisine from its rural origins by First Nature design and a giant chrysanthemum flower made of chinese spoons created by local artist and sculptor Miik Green.